Holidays are a special time of year that can the lift everyone's spirits so holidays during the war were even more important to increase morale and were often used as a tool to help the soldiers. The best example of this would be the famous Christmas Truce of 1914. On Christmas Eve night 1914, the German and the Allied forces ceased fire on the western front. From the trenches Christmas songs and hymns were song loud for all to hear and slowly men from both sides put down their weapons and hatred and wandered into no man's land. It was there that soldiers talked with one another, took pictures, played football, and simply celebrated the holiday with peacefulness. However, at the end of Christmas night, the men returned to their respective sides, enemies once again. Although Alma A Clarke was not involved in the Christmas Truce of 1914 because she did not go overseas until 1918 she still experienced the effects the holidays had on the soldiers and moral. Clarke saved much of the paraphernalia from the Thanksgiving and Christmas 1918, the holidays that occurred after the Armistice was signed. it was still important to lift the soldiers spirits even after the fighting stopped. There were several clippings from the Red Cross Magazine from these months encouraging readers with cartoons and messages to send the Christmas cheer overseas to the troops along with a Christmas handkerchief and present tag; these clippings can be seen on the left hand page. Perhaps Clarke kept these clippings because they meant something special to her and did in fact lift her spirits just as Ethel M. Bilbroughdid in her war diary. The most interesting two items the Clarke decided to keep, in my opinion, are from Thanksgiving 1914. This was only 17 days after the war ended. There is a poem by Capt. Joseph Mills Hanson taken from the Stars and Stripes Newspaper in which Hanson describes a parade by the Allied forces celebrating their victory- “There was laughter and joy in plenty, as, under the autumn sky I saw, through the Arch of Triumph, the Stars and Stripes go by.” Next to that Clarke has a menu from Thanksgiving dinner given to the soldiers at a hospital in Paris; however; in the archival folder Clarke kept a second copy of the same menu that on the reverse side of that menu there was something very different. 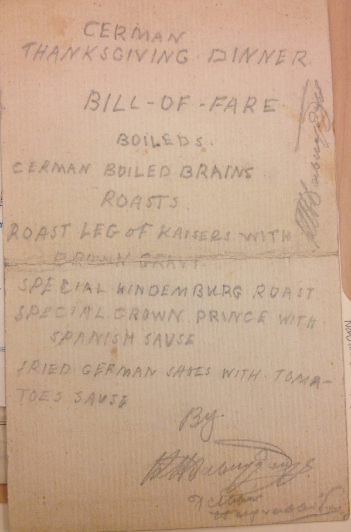 Written in pencil someone wrote of eating boiled German brains and roasted leg of the Kaiser. Whoever wrote this was clearly not over the war and kept a lot of hatred for the Germans in his heart even during the holiday season. Some would say that the US had been successful with their propaganda to turn the nation against the germans as Celia Malone Kingsbury is quote in saying in her book, For Home and Country, “Propaganda in the United States, Great Britain, and France urged children to fall in line… and above all to hate everything German.” Although the war was over and the Allied forces had won, the hatred still burned bright in many American’s hearts. Apart from using the holiday season to lift people’s spirits Christmas was, and still is, a largely commercialized holiday. The Parker Pen Company, like many other used the war as a selling point during the holidays advertising their product as the perfect gift for the soldier in your family. Parker Pen Co. also states in their ad that “our boys” prefer Parker Pens and that every soldier fighting in the war already has one. In doing so they are building themselves up as a company that supports the war and “our boys” fighting in it. Although Christmas was a time to lift people’s spirits and boost morale on the warfront, businesses always seem to find a way to get their two cents in. Cover image AlmaClarke_BMC_045r English WWI Scrapbook, Alma A. Clarke Papers, 1914-1946, Special Collections Department, Bryn Mawr College Library. Page 1 image AlmaClarke_BMC_045r English WWI Scrapbook, Alma A. Clarke Papers, 1914-1946, Special Collections Department, Bryn Mawr College Library. Page 3 image AlmaClarke_BMC_044v English WWI Scrapbook, Alma A. Clarke Papers, 1914-1946, Special Collections Department, Bryn Mawr College Library. Page 4 Kingsbury, Celia Malone. "Learning to Hate the German Beast." For Home and Country. U of Nebraska, 2010. 169-172. Print. Back Cover image AlmaClarke_BMC_bc English WWI Scrapbook, Alma A. Clarke Papers, 1914-1946, Special Collections Department, Bryn Mawr College Library. Did women have a Great War?